I can still hear the sound of cleats brushing along the locker room floor. The scent of sweat-filled jerseys fills the air as I throw on my shoulder pads and strap up my helmet. We were the St. Francis Browns Senior Football Team, about to go to war. I wasn’t playing. In fact, I never started a single game. I weighed maybe 130 pounds soaking wet with bricks in my pockets, but one person made me feel like I was more than just a benchwarmer. Sam Stambene began coaching the St. Francis Browns in 2001. I had the pleasure of playing under him for three seasons. When I met him I was just a boy with little vision or aspiration. Little did I know, he would help shape me into the man I am today. 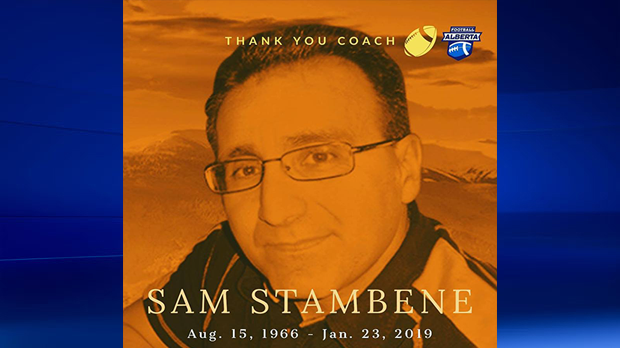 Sadly, Mr. Stambene or ‘Sammy’ as some of us used to call him, suddenly passed away at the age of 52 on Wednesday, Jan. 23. I haven’t stopped thinking of him since I heard the news. When I think of Sam, I can’t help but smile and laugh. For starters, you could pick him out in a crowd of a thousand people just by what he wore. His St. Francis Browns polo tucked in to some hiked up shorts and those classic transition lenses. When those shades came on, you really knew the man meant business. And boy, was he tough. He pushed us to the breaking point, even further than I ever thought the human body could be pushed. Sam’s favourite workout was ‘thrusters’ - a full body squat with dumbbells and then a shoulder press straight up to the sky. It was intense, but so was Sam. When he coached, the sound of his whistle would be embedded into your brain. You’d hear it so much, you’d wake up to it in the middle of the night, but Sam would always demand more. It’s because he believed in hard work to achieve success and he knew that anyone could do it with the right support. The man HATED losing with a passion, even more than I think he ever wanted us to win. There’s nothing like a pre-game or half-time speech from the one and only Sam Stambene. He really set the stage and put fire in our bellies. We may have been the St. Francis ‘Browns,’ but Sam had instilled in all of us the ‘eye of the tiger.’ We always got a chuckle out of his love of movies – always trying to somehow incorporate them into the standard teaching curriculum. The man loved the Rocky films, Arnold Schwarzenegger’s famous ‘Pumping Iron’ documentary and especially the movie, Gladiator. “Are you not entertained? !” – That was Sam’s favourite line. He’d flex his arms and smile as he said it. The man was fit. He was an avid runner and every once in a while he’d lift twice his weight over his shoulders and show us all up in training. He had a sense of humour and that’s what we loved most. That was Sam. Always giving it 110 per cent in every aspect of his life. Sure, the man was a little rough around the edges, but inside he was a kind, gentle and thoughtful soul, always putting others before himself. If someone needed a hand, Sam was there. He changed football in this city spending countless hours with young junior players and coaching them to reach CIS, NCAA, the CFL and even the NFL level of play. He even took time for the benchwarmers like me. Sam saw my potential as a runner. He signed me up for my first 10 kilometre race. Fast forward nearly a decade and I’ve now run seven full marathons. It’s all because he took the time to believe in me. Sam challenged us. He mentored us. His door was always open for guidance or to help us learn from our mistakes. Sam loved all of his students unconditionally. To him, we weren’t just another number on a list. To him, we were a part of his family – at times he felt like a second father. Fatherhood was very important to Sam. His two children Roman and Francis were his greatest joys. His ultimate dream became a reality when he coached both of his sons to provincial football championships at St. Francis. That last victory was especially entertaining – a 3-2 win (yes, that was the final score) over the Harry Ainley Titans to take home the Alberta Bowl title. Sam, we will never forget you. You touched the hearts of so many lives around you and we will cherish all the memories. I know there’s a whistle, a headset and a championship trophy waiting for you in heaven.